I remember in the early days when we were backpacking the Olympics of Washington and it started to rain. You thought it would get better. You really believed it would because you grew up in New Mexico where it’s sunny almost every day. After 24 hours of non-stop rain I declared we were packing up and moving on, in the rain. We discovered that a journey can be magical, rain or shine or horizontal snow. And that is how we choose to live our life together to this day. Throughout the years there have been so many great moments along with a few very hard times. I’m glad that you are my eternal traveling companion – then and now, rain or shine, laughter or tears, but always love. There is no way for you to ever know how much you broke my heart the day you left. Not a day goes by that I don’t miss you. I often find myself chuckling over something silly that I know you’d appreciate or discovering a little knick knack you had given me: the little moon doggie, the office supply cube, a newspaper clipping. I still have your number in my address book, have all of your letters squirreled away someplace safe, hear your voice in my head. I don’t cry as much anymore, but it still catches me by surprise now and again. I think of the plans we had – to grow old together, to take care of Mom and Dad together, to watch your children grow up, to be best friends and sisters into old age. I still keep you in my heart. Can you tell how much I love you even though I don’t know how to say it? Some of my earliest memories include walking with you on a sunny afternoon around the neighborhood. I always felt safe and secure with you near. You were the calming presence. You never yelled, you were never mean, your eyes danced like sparkling stars when you smiled. You held my hand when I walked up the stairs as a toddler. Now, I offer you my arm or my hand when we walk together. I don’t understand everything you say to me and I’m pretty sure you don’t understand everything I say to you in my mangled Mandarin, but it doesn’t matter. Your eyes still dance when you smile and I know what you mean when you squeeze my hand. Thank you for letting me be me. Thank you for getting who I am. Thank you for being you. I honestly don’t think Moses said, “Word up, my people…” but I like the way you tell the story. The way you think and the way you treat others challenge me to think differently, to do better, to be better. I love that about you. We make a GREAT team. It’s a joy to work with you. It meant so much to me that you were there when I needed you most, and I didn’t even have to ask. Your stories make me laugh. Your curiosity helps me learn. Your enthusiasm is infectious. Watching you raise your children makes me so proud to be your friend. Of all the random paths we have taken in this world, I’m glad our two random paths have crossed and that you are a part of my life. If I had a tail, I’d wag it whenever I am with you. That good heart of yours makes this world a better place. I am a fan of love. I am not a fan of Valentine’s Day. Valentine’s Day isn’t love, it’s a gimmick. For me, love is a kiss and sweet words each morning. Love is that warm hug in the kitchen just because you’re there. Love is running through the house squeaking the dog toy – chasing one another and laughing hysterically. Love is poring over maps together to plan the next backpacking trip. Love is calling to the other to go outside and admire the moon one fine evening. Love is curling up under the covers and whispering plans to one another for the next day. And in the House of Butter, love is also about making a great meal to enjoy and share. We don’t have any plans for Valentine’s Day other than to watch the weather, pack our gear, and try to clean out the refrigerator. I am an unromantic, if you will. I was vaguely aware of Valentine’s Day with the red, white, and pink assault on the interwebs and in the stores. Mostly, I tried to avoid the stuffed bears with satin pillows embroidered with “I WUV U!”, the bouquets of roses or tulips, the chocolates, and the ever-platonic houseplants. I got my groceries for the dinner I was planning and I was out of there. Sometimes I’ll have a dish in a restaurant and like it so much that I try to make it myself. It’s taken a few years for me to get to that point, you know. My success rate has improved considerably since I started food blogging and learning about cooking and baking. The early years had their fair share of disasters. These days it seems to fall together thanks to some intuition, research, and experience. 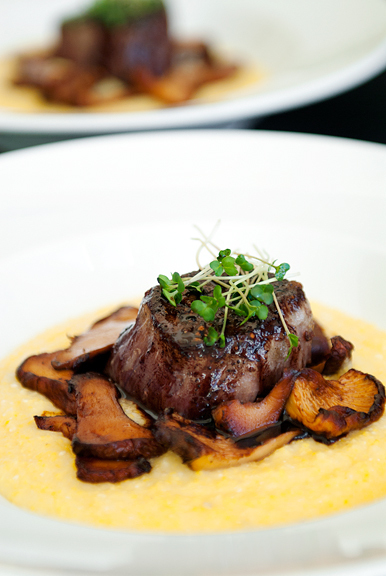 I had been wanting to make something with polenta for a while, so that was on the weekend menu. But from the moment I tasted the pistachio crème brûlée at Bacaro I heard a little voice from the dish murmur, “I am your destiny.” Indeed – this past weekend it was my density destiny. Crème brûlée is relatively easy, but the extra step of squeezing out the nut meat makes it a little more tedious and certainly more messy. I’m here to tell you it’s worth the hassle. 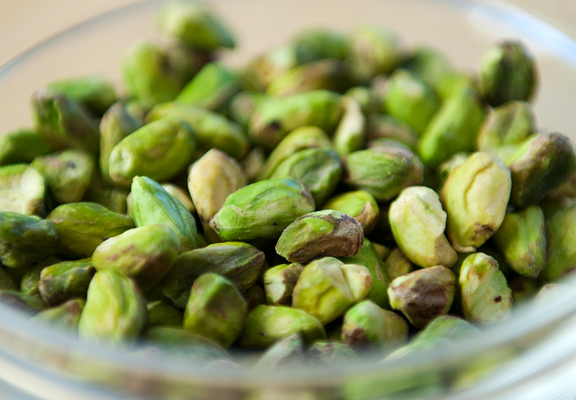 If you like pistachios (and I do, I really really do) then this recipe will win you over. 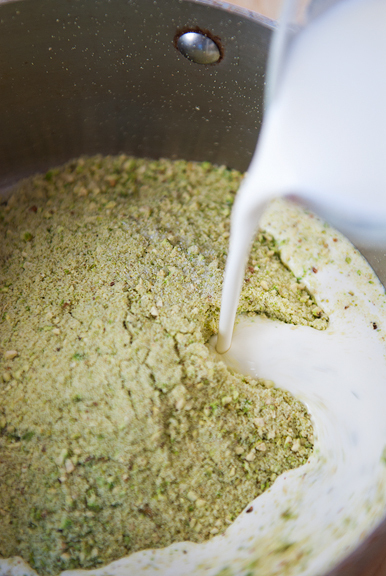 The custard has an ever-so-faint green hue from the pistachios and the flavor is both beautifully floral and nutty. It’s not overly sweet, which I like because the sugar topping provides what sweetness you may desire. The flavor and texture are what I characterize as delicately decadent. 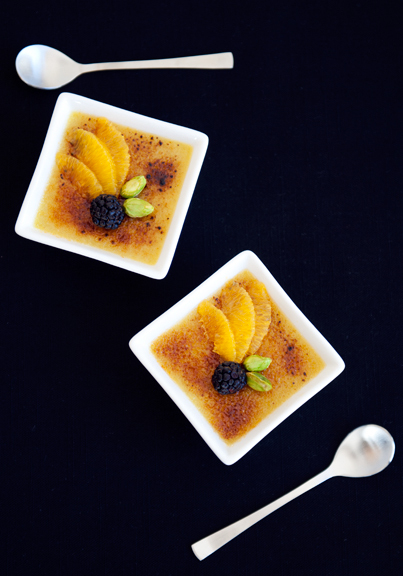 I served these with fruit garnishes since the acidity balances the burnt sugar and creamy custard nicely. Jeremy thought it was the perfect ending to our meal. This dessert is so lovely, I’m adding it to my dinner hostess repertoire. You might should too. Preheat oven to 350°F. Spread the pistachios on a clean baking sheet in a single layer and toast for 5 minutes. Remove from oven and let cool completely. 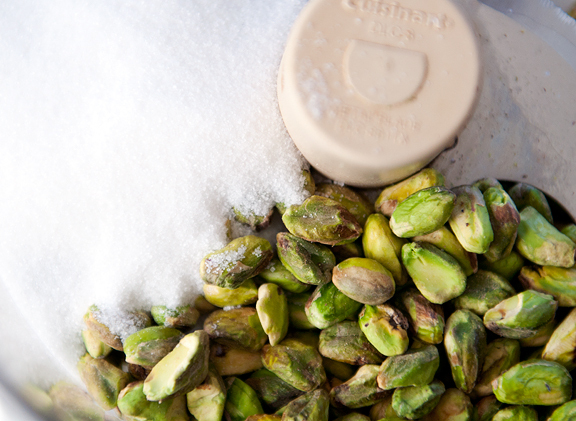 Rub the pistachios together to remove the skins. 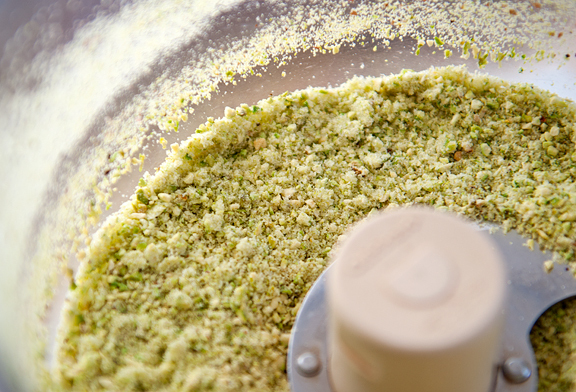 Place the pistachios and sugar in a food processor and pulse until finely chopped, but not a paste. 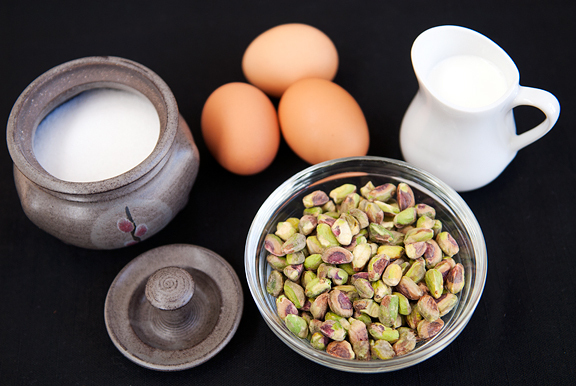 Place the nuts, cream, and salt in a saucepan over medium heat and stir until it becomes hot. Remove from heat, cover with lid and let steep for 30 minutes. Boil a pot of water. Pour the contents from the saucepan through a fine mesh sieve into a bowl. Run a clean kitchen towel under cold water and wring out as much water as possible. Dump the pistachio solids into the center of the towel, wrap the edges of the towel up around the nut meat, and squeeze any excess liquid out into the bowl. Discard the pistachios. 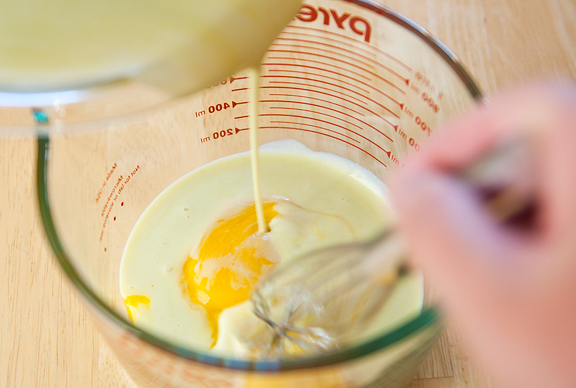 Whisk the egg yolks in a bowl or vessel and pour the cream while whisking. Pour the mixture through the fine mesh sieve into your ramekins. Place ramekins in a large roasting pan and pour the boiling water into the pan taking great care not to let the water run into the ramekins. Bake for 35 minutes (the recipe says 20, but it was way too liquid in my oven). Remove the ramekins from the oven and the water bath. Let cool, then refrigerate for 4 hours. Twenty minutes before you are ready to serve, remove the ramekins from the refrigerator. 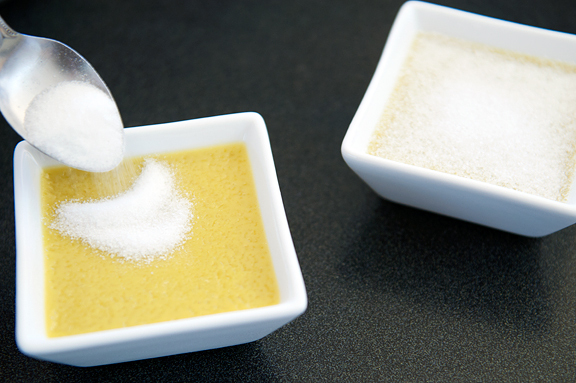 Just before serving, sprinkle a tablespoon or more of sugar on top of each custard and carefully shake it around to evenly distribute. Light propane torch and apply heat to the sugar until it browns and bubbles or place all of the ramekins on a baking sheet and put under the broiler until sugar is caramelized. Serve immediately. Makes 4-6 (depending on the size of your ramekins). I just woke up, tired and blind, and was just paving through new stuff in the RSS-reader. I saw pistachios. I saw creme brulee. A dream came true and I thought I was dreaming still. Wow. Need to try this. And read it, of course! What lovely letters! Oh, yeah, and the food too! Happy Valentines Day. The rain never really does stop in the Cascades…I know someone in my life who would go crazy for a pistachio creme brulee. Thank you for recreating the recipe! Sweet…both the letters and that pistachio!! I hear you. Lovely writing. 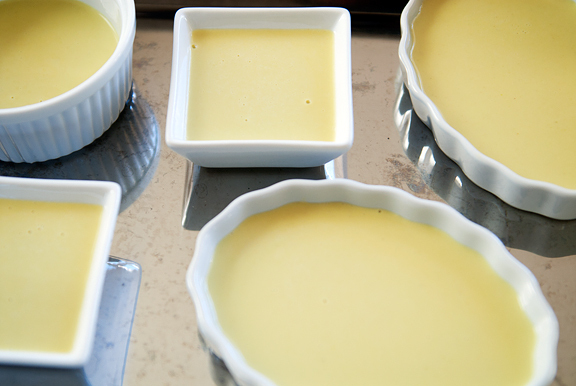 And lovely recipe – me and some friends have been trying to recreate a pistaccio creme brulee from a certain restaurant, too, to no avail. Though I’m pretty sure they are not straining, will try this anyways as it is bound to be great! Lovely thoughts, as always. I just might have to make this tonight because I think if I see one more chocolate recipe I am going to gag! This whole meal looks divine. I’m a fan of love too and I think all the red and pink muddle people’s vision a bit. A good meal and good company is all I want! As I read your words today, I am put to shame because I have absolutely everything I need and want and here I am-moping- because of a silly tiff with my husband. I love how you live your life to the fullest and don’t give a damn about what doesn’t matter to you. You are truly an inspiration! That recipe looks delicious even to me, not particularly a fan of creme brulee. But what I really enjoyed was [were? I’m grammar-challenged before coffee] the sweet words to sweet people in your life. I agree with BG: your attitude is an inspiration. So glad you’re out here blogging! wiping my eyes and clearing my throat as I try to type this. i’m an emotional person. i clung to every word in each love letter. thank you for sharing this, and reminding us what love really is, every day of the year. and the menu looks just terrific, when do we eat? and kaweah is as precious as always. Love that dog. and you. too much!!! Wiping tears from my eyes and telling the kids I’m just tired. Your words are beautiful. Thank you for sharing your inner thoughts with us. Thank you for sharing this, Jen. You are awesome. This is why I just love you, Jen. Thanks for the love you share. I’m not much of a V-Day gal myself, although I love… expressions of love, no matter the day. And, I love pistachios. ;) Beautiful expressions in this post. Those little letters are so beautiful…I felt…..teary….happy….love….Thanks for sharing with us. 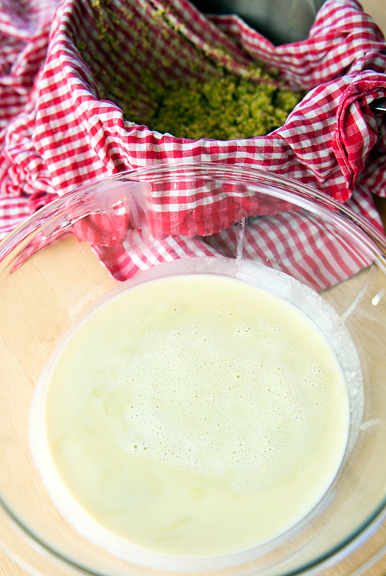 Pistachio Creme Brule sounds so yummy…I will try to make it for sure. Have a great day. Big, big love to you, Jen, today and always. oh my gosh, I just fell in love you you over this post. love lettters…beautiful. dinner…amazing. pistachio creme brulee….i died! You touched the deepest corners of my heart with your love letters. Love resides in small things, mementos, kind words, a firm hand holding yours, comforting hugs…I am crying now, but those are happy tears of one who loves and is loved. Hi Jen (and Jer), wanted to tell you we are using your classic creme brulee recipe in our restaurant in Antigua, Guatemala. In a test panel it rated #1 and, yes, there is tough competition here as it is a World Heritage Site with lots of tourism. Come and see us! 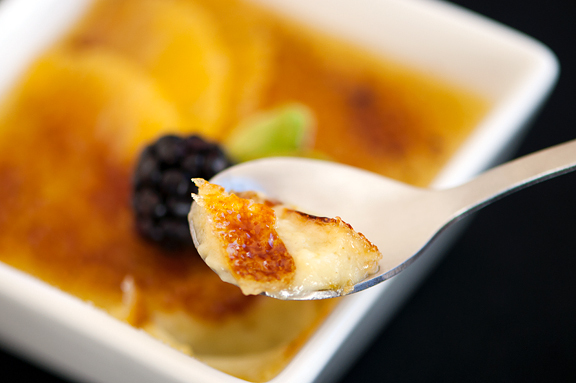 The creme brulee looks just lovely. Valentine’s Day has nearly passed me by this year, but I’m lucky to have a life so filled with love. Love may, in fact, be, pistachio creme brulee. your love letters are very touching. i’m glad you are blessed with so much love in your life – you certainly deserve it and do your part to generate it. though i have to disagree with you about not being a romatic – as i certainly hear you as one in the true sense of the word. thanks jen. a beautiful post for my 19th anniversary. i love your letters to kris, jeremy and all you love! Absolutely precious, every single bit (and bite, no doubt). Wow I couldn’t get past love letter number 2 without my eyes filling with tears. You are a beautiful writer. Thank you for sharing these with us. You are lovely writer, what a beautiful post to read in morning will carry the love throughout the day and divine creme brulee, you are truly my inspiration Jen! I agree with you so much…I am a fan of love, not of Valentine’s day. People believe they have to buy something to prove it. Your love letters say more than any bottle of champagne or 12 dozen roses (yes 12 dozen LOL). They even made me cry. And the only reason I truly read this morning was that it said Creme Brulee! Thank you for making me not feel like a grumpy old woman for humbugging the holiday but not the idea. Each day we awake, we are so blessed with the bloggers talents. Bringing us into there world, making us a friend without even knowing who we are. For that I am so grateful. I have learned so many things from art to poetry to fantastic recipes. They make you laugh, cry and even give that hope that you can do better for yourself. So this is my Valentine gift for all the bloggers out there. So glad your staying with us Jen. As I become immersed in the artists blog. You take me to heights of inspiration. Keep creating what god’s gift you have been given. Will start to flow through me. Those crèmes brûlées are one of the most tasty looking recipe you’ve posted on the blog recently. Beautiful. Thank you for sharing your life, through your stories, photos and food. Always an inspiration. 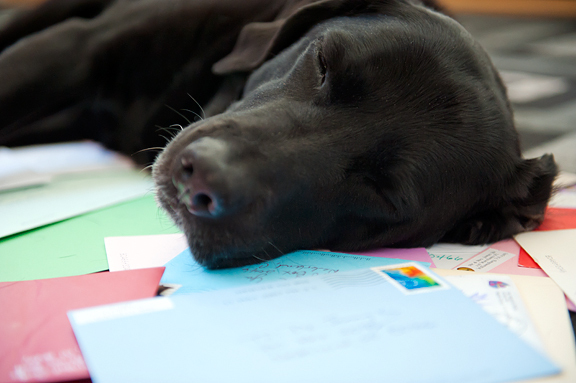 I thought your first little love letter, right under the picture of sleeping dog, was a love letter to her after she …… I was getting all teary-eyed (since my Cosmo recent;ly passed)… and then I realized that you were just expressing your love on Valentines Day. Man. I was so worried…. I chanced upon your blog through smittenkitchen and how lucky i feel lucky to have networking in our age. Your posts are so beautiful..i loved your love letters. and i know you lost your sister. that post made me cry. I too have a younger sister whom i love so much, and yet at times i command and fight and am critical. but after reading your posts, my outlook has started to mellow down. you are my inspiration. and on Vals day i baked your flourless chocolate cake (not daring baker one). it turned out just awesome! my batter in pan had lots of bubbles which you had warned against, and may be thats why it took almost 70 minutes to bake but it gave a lovely crunch at top in contrast to lovely cake underneath. You are a great baker, and an amazing human being. And i am lucky to have you around. Beautiful love letters, Jen. And cute spoons with the creme brulee, too! My parents are visiting next weekend, and I think something similar to this meal (because there are no chanterelles within a couple hundred miles of Carlsbad!) would be perfect. My mom loves pistachios, my dad loves beef, my husband loves creme brulee, and I love polenta…but I’m not sure my mom and dad will love polenta. We’ll see. Anh – thank you, sweetie. Kate – sending you loving thoughts. I know you’re missing your Daddy and I wish I could give you a hug. jacquie – aww, you’re very kind, my dear. If you like pistachios, try Martha Stewart’s pistachio cupcake recipe. It is fabulous (like eating pistachio gelato). 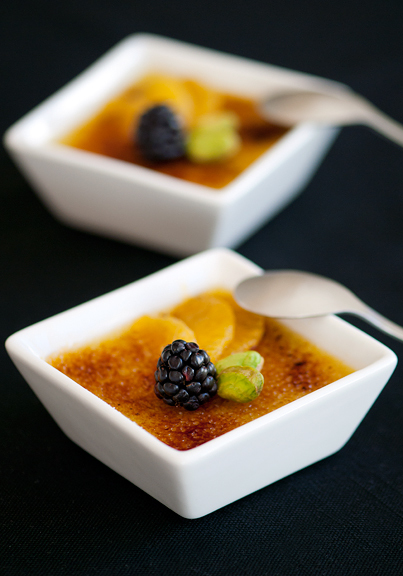 Thank you for posting this beautiful pistachio creme brulee recipe.